Everywhere I've worked timesheets have always been the source of rancour. Whether it's people not completing them on time, using the wrong project codes, using an old template, or having to fill out three separate forms every week - timesheets always seem more complicated than they need to be. Outlook and Excel are the defacto tools for timesheeting, but putting aside that GoogleOffice is free, Google's Calendar and Spreadsheets are actually better suited to the job. The access controls and collaborative features of Google Calendar and Spreadsheets streamline timesheeting in a Google Office. Annoyingly spreadsheets isn't part of GAfyD yet, so you'll need payroll to create a Google account for the job. UPDATE: Spreadsheets now is available as part of Google Apps. So just share your timesheet with the same timesheet user you share your calendar with. With payroll and staff both having access to timesheets everyone involved can 'sign off' electronically thanks to the built in revision control. Go one step further and share read access with any external agencies that might need timesheets (like agencies or umbrella companies for contractors). This prevents the seemingly endless duplication -- I've had to fill out 4 separate timesheets for a single contract. Spreadsheets supports exporting to Excel/ODF and PDF so you can print or save backups. I personally save PDFs of all timesheets after I complete payroll to make sure there's always a backup once money's changed hands. If you'd like to make things even easier, you can automate the 'filling in' part of the timesheet process by using my Google Office Timesheet Tool. I recommend using calendar to track your daily activities on the fly. To make my life even easier I've written a Windows tool for timesheet data entry that uses the calendar API to make this really quick and easy. Start by using Google Applications for Your Domain to provide timesheet calendars for you and your staff. 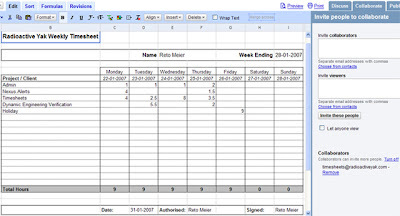 Create a 'Timesheet' account and invite it with read access to all your employee timesheet calendars. Then have your staff record their daily activities on their timesheet calendars, adding a new entry whenever they switch clients / projects. That timesheet account can now get times for invoicing and timesheets without having to chase up every team member asking how long they spent doing what. When you enter your activities make it easy on yourself by including the project or client in the title text - even if that's *all* you put in the title. If you get the level of detail right and make it a regular intraday activity this should take most of the pain out of timesheeting. 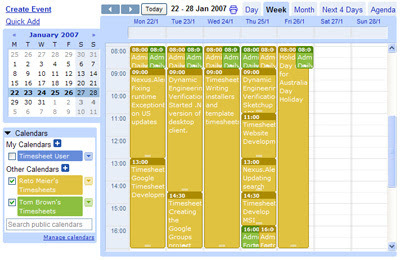 Create (and regularly update) a shared company wide 'Admin' calendar that includes staff meetings and public holidays. You and your staff can copy these admin activities straight to personal timesheet calendars. Include a 'Make sure Timesheets are complete' task with a reminder in your admin calendar for the day before you usually process payroll. Updated (22/02/2007): Google Apps now includes Google Docs & Spreadsheets. I've just installed the timesheet tool and set up the templates. I've run the reporting module. It tells me it's finished writing timesheets, but I can't find where the finished timesheets are. I've looked on the uploaded timesheet, but it's still blank, even after running a timesheet for last week. This is really interesting. I'm very curious though, with all of the frustration with old spreadsheets you moved to an online spreadsheet on Google. Don't some of the same complications arise? How do you keep people from changing other folks' hours? Are you completely against companies that specialize in hosting an employee timesheet online? The way that you're using the google docs and calendar are definitely impressive, though. Very impressive indeed. Our big issue with spreadsheets, and even Google doesn't solve this, is access control and permissions. We needed to be able to filter projects, jobs and tasks to certain groups of employees. Also we needed support for entry via cell phones, and spread sheets are not tailored for the small screen. We implemented Pacific Timesheet and could not be happier. In addition, it integrates with our payroll system seamlessly (Lawson), which is not so easy with spreadsheets. Head over to Jott.com for all your phone -to-google calendar needs. I don't think GoogleOffice is free.